A collection of fine 18th and 19th century Ethnographic Objects and Bark Paintings. Items that took thousands of years to perfect, are elevated, in the hands of the 'collector', from mere curio to beautiful examples of 'primitive' art and sculpture. Fine Aboriginal, tools, weapons, utilitarian and ceremonial objects, made, and used for their original purpose, not for sale, handled with care for a century or longer can feel like silk to the touch and exhibit a lustrous glow that seems to emanate from deep within. 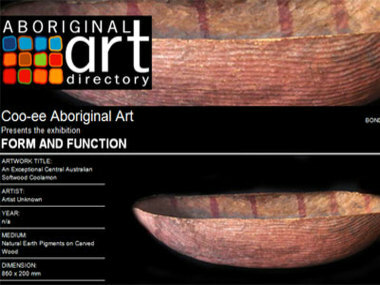 View Coo-ee Aboriginal Art presents Form and Function, Bondi Beach Australia eBlast.